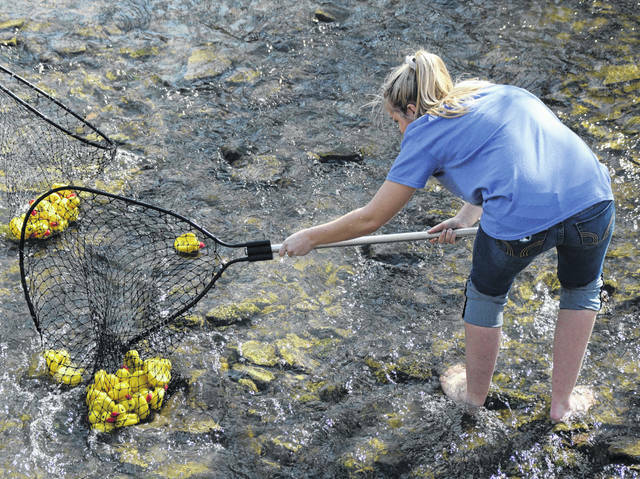 Grace Grant, cousin of Bluffton University student Destiny Grant helps corral rubber ducks in Riley Creek. 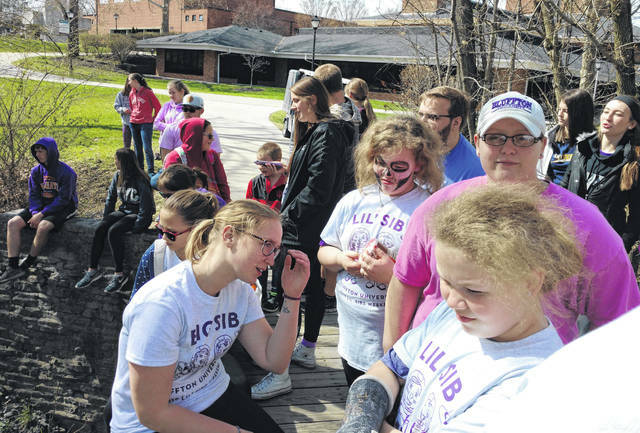 A small crowd gathered on the footbridge over Riley Creek to watch the annual duck race Saturday at Bluffton University. “It’s been all about ducks, kind of a symbol of spring. … The pinnacle of the event is the duck race,” said Kevin White, assistant director of the university complex at Bluffton University. The yellow ducks are dropped into Riley Creek to float downstream. Each duck has a number and each person who sponsors a duck is given a number. If the duck with that number beats out all of the other ducks, you win a prize. In this case, organizers were giving out space-themed gift baskets to the top three finishers, with proceeds going to the Bluffton Public Library. “Public libraries, I think, are super important for basically everyone, let alone a college. The public library here in town really does a lot for our students and a lot for the community. So we want to make sure that us, as a university and the community are both working together to get the children in the community and our students more education,” said White. About three dozen people lined Riley Creek to watch around 100 rubber ducks race to the finish line. Many of those watching even paid a buck to “adopt” a duck. The top three ducks that crossed the finish line were adopted by Nathan Heinze, Nora Kaufmann and Tricia Bell. Prior to the race, people could enjoy activities inside Bluffton University’s Sommer Center. Several inflatables were set up on the gymnasium floor and there were all sorts of activities for the kids, many, who were younger siblings of Bluffton University students. It was Little Sibs weekend. “As the parents are coming up and picking up the Little Sibs, we kind of make it a family deal so that parents can spend time with all of their children,” said White.